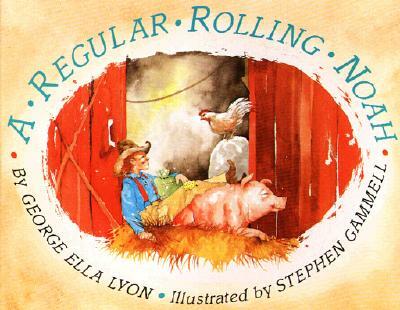 “A Regular Rolling Noah” was one of the first books written by George Ella Lyon, at the age of 37. But she’d just published her first collection of poetry, and she applies the same skills to her narration. Illustrator Stephen Gammell keeps the story intriguing with some simple but realistic watercolors. The train’s engine has a red smokestack and its front is a big yellow circle. The skies are pastel blue, with white clouds, and the train’s tracks are surrounded by the soft green of a grassy field. There’s darker greens for the mountains when the train travels on its journey – and of course, there’s also red and yellow boxcars. The farmhand rides along with the animals, and it’s a journey into the unknown. Black smoke puffs fro the engine, as the train travels farther and farther. The boxcar door is open a crack, and hay spills out while the farmhand milks a cow. The next morning, when they reach a new railyard, the farmhand trades eggs for coffee with the hoboes. “A regular rolling Noah,” one of them suggests, and the boy with the cowboy hat smiles. He has to rush after the train as it leaves the station, and then sweep out the boxcar to put down fresh hay. My favorite picture shows the boxcar from the inside, crowded with cows, a horse, and chickens. There’s a pitchfork in the hay, and the boy feeds the mare a green apple. And in the next picture, they’re all peacefully lying on their side to sleep – the horse, the cow, the calf, and the farmhand.